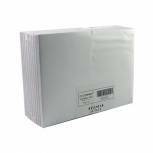 Q-Connect Ruled Stitch Bound Executive Pad 50 Pages A4 White (Pack of 10) KF01386 Pack of 10 Q-Connect Executive Pads stitched and bound at the head with micro perforations for easy sheet removal. 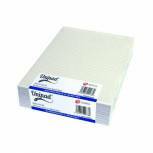 Unpunched 50 sheet White Pads. Ruled Feint and Margin. A4. 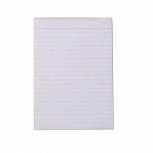 Q-Connect Narrow Ruled Board Back Memo Pad 160 Pages A4 (Pack of 10) KF32006 Pack of 10 Q-Connect Memo Pads. Manufactured from quality bond paper that accepts ink without bleeding or feathering and features a board back for rigidity. Each pad has 80 sheets of unpunched narrow-feint ruled White paper. A4. 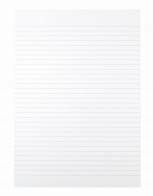 Q-Connect Plain Scribble Pad 160 Pages 127x76mm (Pack of 20) KF27020 Pack of 20 Plain note pad. 160 pages per pad. Headbound. Lightweight 70gsm paper. Ideal for scribbling notes. 5x3in. 127x76mm. Pack of 20 pads. 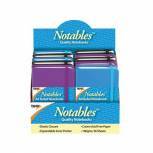 Q-Connect Ruled Scribble Pad 160 Pages 203x127mm (Pack of 20) C60FW Pack of 20 Feint ruled note pad. 160 pages per pad, headbound. Lightweight 70gsm paper. Ideal for scribbling notes. 8x5in 203x127mm. Pack of 20 notebooks. 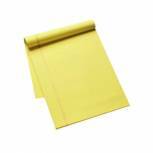 Q-Connect Ruled Stitch Bound Executive Pad 50 Pages A4 Yellow (Pack of 10) KF01387 Pack of 1 Q-Connect Executive Pads stitched and bound at the head with micro perforations for easy sheet removal. 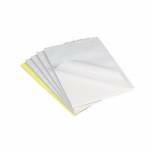 Unpunched 50 sheet Yellow Pads. Ruled Feint and Margin. A4. 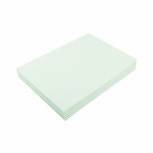 Q-Connect Plain Scribble Pad 160 Pages 148x105mm (Pack of 20) KF27018 Pack of 20 Plain pad perfect for scribbling ideas. Wire bound to lie completely flat. Clean 70gsm paper. Features 160 pages. Dimensions 152x102mm. Pack of 20 pads. Q-Connect Memo Box Black KF21676 Pack of 1 Q-Connect Memo Box. 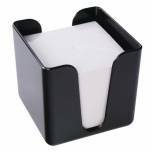 Tough plastic note block holder. Anti-slip feet. Pen rest and 800 sheets of 90x90mm White paper. 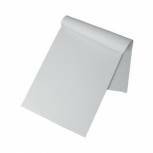 Refill sheets available see KF01119. Memo Box colour - Black. 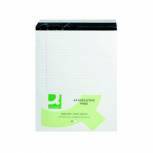 Cambridge Ruled Legal Memo Pad 160 Pages A4 (Pack of 5) 100080168 Pack of 5 Memo pads with ruled pages. 160 pages glued at the head to a sturdy backboard. 70 gsm paper. 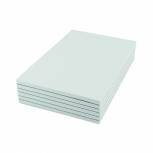 Q-Connect Plain Board Back Memo Pad 160 Pages A4 (Pack of 10) KF32007 Pack of 10 Q-Connect Memo Pads. Manufactured from quality bond paper that accepts ink without bleeding or feathering and features a board back for rigidity. Each pad has 80 sheets of unpunched plain White paper. A4. 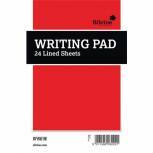 Q-Connect Plain Scribble Pad 160 Pages 203x127mm (Pack of 20) KF27019 Pack of 20 Plain note pad. 160 pages per pad. Headbound. Lightweight 70gsm paper. Ideal for scribbling notes. 8x5in. 203x127mm. Pack of 20 pads. 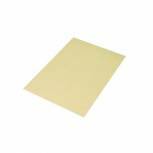 Q-Connect Feint Ruled Board Back Memo Pad 160 Pages A4 Yellow (Pack of 10) KF01388 Pack of 10 Q-Connect Memo Pads. Manufactured from quality bond paper that accepts ink without bleeding or feathering and features a board back for rigidity. Each pad has 120 pages of unpunched feint ruled Yellow paper. A4. 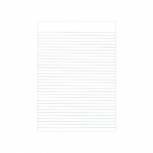 Duke Writing Ruled 24 Sheets (Pack of 36) 101-0173 Pack of 1 Duke writing paper. Ruled, 24 sheets. Pack of 36. 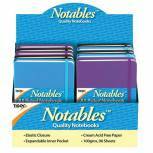 Notables A6 Notebooks Assorted 192 Pages (Pack of 10) 301353 Pack of 1 Notables A6 Notebooks, Assorted Colours, Pack of 10. Ideal for taking notes on the go thanks to the A6 size. Each notebook has an elastic closure as well as an expandable inner pocket to secure loose paper. These notebooks have 192 pages of cream, acid free 100gsm paper. 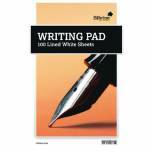 A4 Feint Ruled Pad (Pack of 20) WX32009 Pack of 20 Pad for short messages. Feint ruled for easy accuracy. A4. Pack of 20 pads. 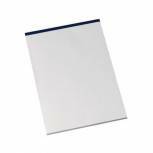 Q-Connect Feint Ruled Board Back Memo Pad 160 Pages A4 (Pack of 10) A4 Memo F Pack of 10 Q-Connect Memo Pads. Manufactured from quality bond paper that accepts ink without bleeding or feathering and features a board back for rigidity. Each pad has 80 sheets of unpunched feint ruled White paper. A4.